Blockchain is a groundbreaking technology and has multiple use cases. It allows for complete user transparency, which is crucial when companies are hiring and sorting through candidate applications. 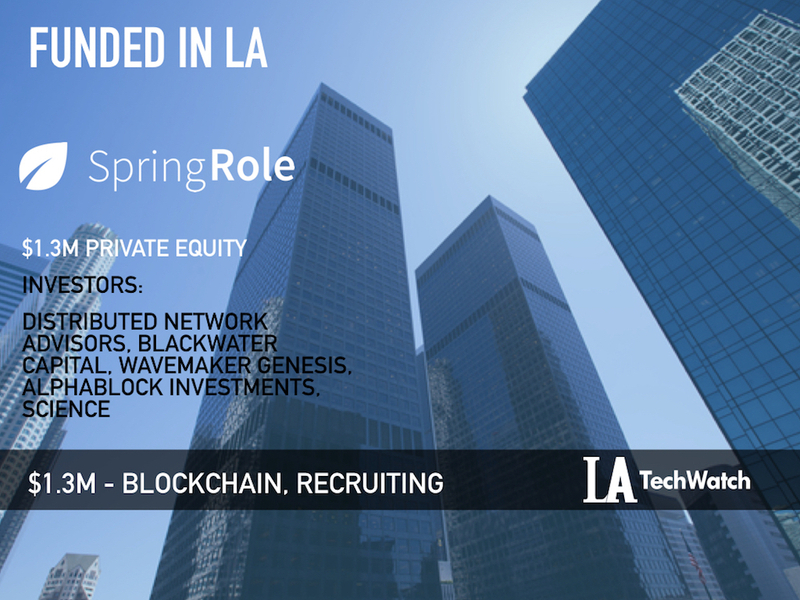 Well, a blockchain-powered professional protocol platform would save companies a ton of time and aggravation, and that is exactly what SpringRole is doing. This platform creates an efficient hiring process by enabling employers and other parties to confirm their skills, experience and credentials. Thus, further profile verification by future employers will not be necessary. Welcome to the future of recruitment. LA TechWatch spoke with CEO and Founder Kartik Mandaville to learn what the company plans to execute in the upcoming months after receiving their latest round of funding. Our initial investors were Science Blockchain, Blackwater Capital, AlphaBlock Investments and Distributed Network Advisors. However, recently we completed our private funding round, raising $1.3M, which included our initial investors, along with other private investors. Tell us about SpringRole’s product or service. We are building a blockchain-powered professional profile attestation protocol. In this world of unverified and possibly unauthentic online professional profiles, SpringRole profiles will be verified and attested on the blockchain to ensure the highest level of authenticity. SpringRole will negate the need for companies and hiring managers to spend time, effort and money in verification of profiles before hiring. It will lead to a more transparent and efficient hiring process for candidates and companies, both. What inspired you to start SpringRole? I distinctly remember during my freshman year of college, I thought of developing a computer automation to navigate the recruiting landscape and secure myself an internship. While my friends walked together in groups to career fairs, dressed in suits, I was in my dorm room applying to over 200 companies online in my pajamas, emailing the HR of each company personally. I was devastated when I received only 20 replies, and worse, only 5 interview calls. After graduating from Carnegie Mellon, I was given the opportunity to work at Science as their CTO. It was while I was there, that I realized that I was probably missing out on top talent that were not part of any network in India or Santa Monica for key technical lead positions. I realized then, that just as I had built a Facebook birthday-wishing application in college, I could also build something that could teach the world how to become successful using professional networking, and also reward those on digital platforms who had skill superior to those of their peers. Thus, SpringRole was born. What makes SpringRole different from its direct competitor i.e. LinkedIn, is that on SpringRole, all the data that a user enters on his professional profile is verified and attested on the blockchain. Any attestation on the blockchain is immutable, i.e it cannot be altered by anyone, even by the user who uploaded it. This implies that when employers view a SpringRole profile of a candidate, they are assured that all the information is verified and genuine, and this would mean that they would not have to spend any money on further verification. 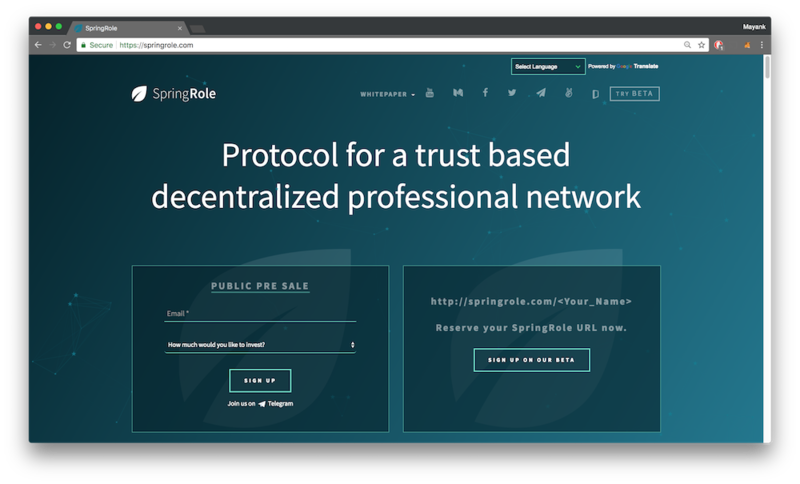 Another way that makes SpringRole different is that since it’s on the blockchain, it is decentralized. User data on SpringRole belongs to the user that uploaded it. The user has full rights on the data and is even compensated when other users use that data, in the way of gaining employment through endorsements, or when SpringRole uses that data for anything else. We are targeting professionals from all backgrounds to create their profiles on SpringRole. This is a huge market, exemplified by the almost 500 million users of LinkedIn. At the same time, we are targeting employers and academic institutions, to carry out attestations through our protocol. This is again a large market. As we are building a verified professional profile which can be used for multiple things, we will have a variety of business models. One of the business models is to charge companies a flat fee for verification and the others are job posts and recruiting bounties. Why do we need a professional network built on the blockchain? The biggest pain-point that SpringRole aims to solve right now is the need for re-verification before every new hire at a company. With the SpringRole protocol, information that we read about an individual’s professional profile online will be trusted and attested. An employer will not have to worry about wrong or false information on candidate’s profile before hiring him/her. 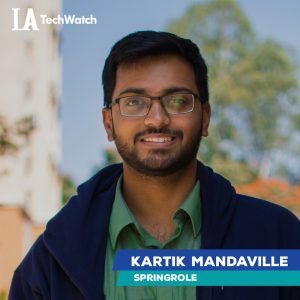 Even considering the future, I believe that the blockchain is going to revolutionize many industries, and SpringRole is doing its part to achieve that revolution in the hiring space. There are a variety of blockchain companies making different products, which when integrated with each other can produce a whole greater than the sum of its parts. We plan to have different partnerships that will benefit the users of all the participating platforms. We raised the recent round through a token sale. Even without announcing the raise, we received huge inbound interest through our network and we talked to each one of them to make sure there was a strategic fit. I believe that it’s important to have a concept or beta ready before heading out to raise capital. It’s important to take out the time to finalize the product idea and the overall vision of the company and product before attempting to raise capital. The primary factor about SpringRole that attracts investors, is that we are solving a real problem of fudged resumes and online profiles. The solution to this problem truly requires the blockchain, and that is why we have chosen it as our platform. Our team is strong and global, and our past experience speaks for us. Even as of today, we are a profit-making company, and that is a testament to our business caliber. According to our roadmap, by the end of 2018, we plan to finish our public pre-sale and public sale, launch the ability to create an entire SpringRole profile, the attestation framework, endorsement ability, graph search and developer API beta. At the end of the year, we will announce our future roadmap. Be scrappy, take out a few weekends and build a product! Over the near term, we are focusing our efforts on getting our product fully ready and functional as soon as possible. At the same time, we are trying to make sure that our customers can make use of SpringRole to its best potential, by negotiating partnerships with other blockchain and non-blockchain companies and products. Just recently, we signed a partnership with Meitu GPIG which enables interns at the firm to get their certificates on the blockchain through SpringRole. Expect to see bigger things along the same lines. Biking – love biking. I used to take my bike out on weekends and bike along the beach. I have even biked from Santa Monica to Santa Barbara. Previous Should You Clone Yourself When Hiring?